Home > Materials Handling and Access Equipment > Forklifts and Attachments > Australian Warehousing Association Inc.
Australian Warehousing Association Inc. (AusWA) is the peak body of the Australian Warehousing Companies and offers a wide range of educational, consultancy, auditing and recruitment services to their members. Australian Warehousing Association Inc. (AusWA) also organise warehousing and logistic events and seminars. Contact Australian Warehousing Association Inc. I would like to enquire about Australian Warehousing Association Inc.
16/12/14 - The final event of the National Forklift Championships was held in Brisbane recently with the competition witnessing some of the best forklift operators in business.The course design for the final round saw a very challenging layout to test the best of skills in forklift operation. The 13 male and four female finalists had to navigate multiple tasks including shooting a basketball through a hoop. Australian Warehousing Association President Bill Henman explained that the core focus of the competition was on safe and efficient operations while complying with national standards. The National Forklift Championships drew competitors from many industries and companies of all sizes, including several female participants. This year’s novelty event of shooting a basketball through a hoop was won by female defending champion, Puna Ririnui from Green’s Biscuits. Puna won on time, as the scores were tied three ways with IGA Supermarkets’ Jayde Graham and Swire Cold Storage operator, Marcelo Fagali. The main event winner of the male division was Andrew Knowles, Personalised Freight Management while the female division winner was Jayde Graham, IGA Supermarkets.National Forklift Championships organisers thanked Nationwide/Hyundai Forklifts, Loscam, AIMM Industrial Training, Signet, Cascade and Construction Training Centre for their support. 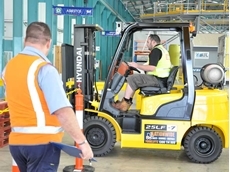 25/07/14 - Registrations are open for the 2014 Forklift Championship organised by Australian Warehousing Association to be held in Brisbane in November.This year’s Forklift Championship is being presented in a changed format. The forklift championship will test the contestant’s eye and hand skill coordination by having them safely operate a forklift in a small area. Every contestant starts with a score of zero with points added when an error is made. For instance, forgetting to wear a seat belt will add three points to the contestant’s score. The AusWA Forklift Championship draws an increasing number of female forklift contestants each year with the judges very impressed with their quality of driving and overall performance. Forklift operators can test their forklift operational skills against the best drivers based on the national standard conditions, by registering with AusWA. Contestants should be over 18 years of age, hold a valid photo ID forklift licence and be correctly attired. The winners receive a trophy and prize money and each finalist receives a medallion. 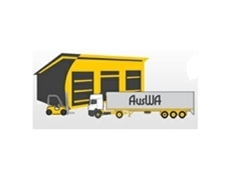 24/07/12 - The Australian Warehousing Association (AusWA) is the Australian member of the International Federation of Warehousing and Logistics Associations (IFWLA). As the Association is affiliated with the IFWLA, it also shares it views and objectives on: promoting the warehousing and logistics industry exchanging information and view on matters of common interest to members advance global connections develop good relationships between membersAusWA aims to be a forum for education, knowledge sharing, networking and support centre for its members who are involved in warehouses and distribution centres in Australia.The Association has been successful in obtaining Federal Government funding for the delivery of the Diploma of Logistics program to its members.Furthermore, the Association ensures that its members have access and given the opportunity to participate in short training courses on an industry relevant topic, such as changes to OH&S legislations.AusWA also organise events and functions throughout the year as a way of informing its members of industry issues, competitions and education panel sessions.